Last year saw adspend see its biggest growth in 7 years, when it grew to over £8.5bn. Video advertising spend grew to £711m, an increase of 50.7%. Video really is taking off in a massive way and it’s an area that businesses need to be looking at in order to reach their audiences and encourage engagement. Mobile video spend increased to £353m, increasing by 98%. You really can’t afford to ignore mobile marketing. Mobile played a huge role in the overall increase in adspending, with the UK spending £2.63bn, that’s an increase of 60.3% year-on-year and this accounts for 30.5% of all digital advertising. 71% of the social media spending is spent on mobile. Consumer goods firms were spending the most on the video and banner display ads, equalling 18% of spend. 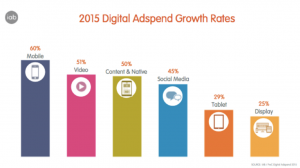 The full year digital adspend information can be downloaded here. Who needs a PC these days when they have just as powerful mobile devices? Sales of PC shipments have decreased 10% year-on-year, equalling 6 million less units sold in Q1 of 2016. PCs include desktop computers and portables such as laptops and netbooks. This isn’t shocking news to most as PC sales have decreased over the past 6 consecutive quarters. These figures only highlight the importance to stop ignoring mobile audiences and embracing it into your marketing and advertising efforts. Econsultancy’s Email Marketing Industry Census, in association with Adestra, reach it’s ten year anniversary this year. 73% of the respondents selected email marketing as either ‘excellent’ or ‘good’ for ROI, an increase of 66% from 2015. Do you need assistance with digital marketing? Get in touch and ask us about our digital marketing services.